Colombia knows how to put on a great show, and so the country’s events calendar is filled with some of the world’s most lively, vibrant and exciting festivals. Some inspired by religion, others by music and most by Colombian culture, have a read of this list to discover which are our favorites and why. 90 percent of Colombia’s population are devout Catholics, so it’s no surprise that this Easter spectacle is celebrated with such fervour every year. For the most elaborate processions and celebrations, head over to Popayan, the religious center of Colombia, where you’ll really get to the bottom of what Semana Santa is all about. Arriving on Tuesday, follow the Holy Tuesday Procession as the participants carry effigies to the center of the city, ready for Good Friday’s procession that represents the story of Christ and his crucifixion. Solemn yet uplifting, you’ll also get to see some incredible performances from musicians that have traveled from all over the world to attend one of Colombia’s most important events of the year. 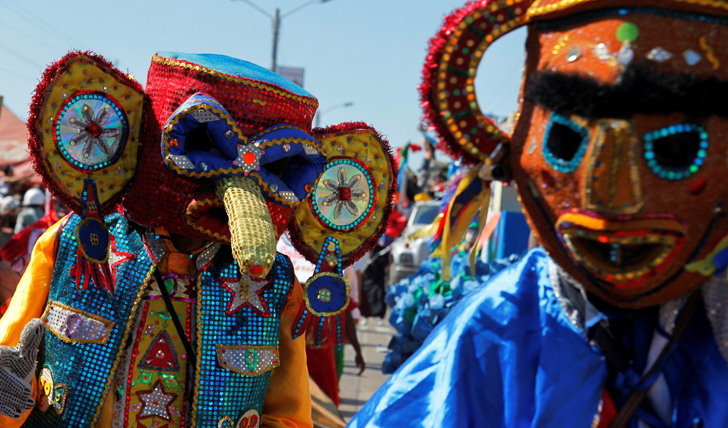 Carnaval De Barranquilla is one of the largest carnivals in the world (coming second only to the Rio Carnival). It’s an important folkloric event that dates back to the 19th century and one in which the locals get fully involved. Taking place in the last few days before Ash Wednesday, the streets of Barranquilla come alive with colorful floats, energetic street performances, exotic music and elaborate costumes. And the most exciting part? Well, it has to be the Batalla de las Flores, the carnival’s spectacular parade led by the carnival queen herself. Finishing with the colossal Grand Parade, the carnival culminates in the funeral of Joselito Carnaval, the spirit of the Carnival, who’s no doubt been sent to his grave by four days of non-stop partying. A fitting end to an exciting and elaborate spectacle. One of Colombia’s biggest exports is flowers, but don’t worry, they keep plenty for themselves. So many in fact, that there’s a festival thrown each year to celebrate floral beauty in Medellin, the city of eternal spring. Throughout the first two weeks in August, the city blooms, quite literally, into a stunning work of art. The highlight of the festival is Desfile de los Silleteros, a procession that offers the flower growers the chance to showcase their floral arrangements from wooden platforms that they carry on their backs throughout the city. It’s like nothing you’ve ever seen before, or are likely to see elsewhere. Alongside the flower displays you’ll find music performances as well as the largest outdoor horse parade on the planet. Sound a little random? Don’t worry; you’ll go home with plenty of unique stories to share. Set within the walls of the old city, the international music festival is a nine day celebration of musical decadence, with a particular emphasis on classical music. Attracting performers from Latin America and even Europe, as well as spectators from all over the world, it’s the perfect festival for all those music lovers amongst you. You’ll find performances in theaters and outdoor plazas throughout the city and get to see some of the world’s most revered orchestras in action. The setting for such a festival within the confines of such a beautiful and historic city makes this a unique and educational event, so add it to your calendar.